So in case you’ve missed it, the east coast has royally pissed off Mama Nature. Earthquake, hurricane, and now this week, thanks to massive flooding from another storm, we have a plague of snakes. I’m not going to speculate on what might have caused this rift between us and the green lady (*cough*oil pipeline*cough*smog regulation*), but it’s getting downright biblical around here. Relax, I’m not going to talk about the environment or politics or the Bible. I’m just going to talk about the snake. Last night, I walked out into the garage to get... what the hell was I going out there to get? Cleaning products? I don’t know. Whatever it was, I never got it, because there on the floor curled around the wheel of the garage fridge/freezer was a four foot black snake. 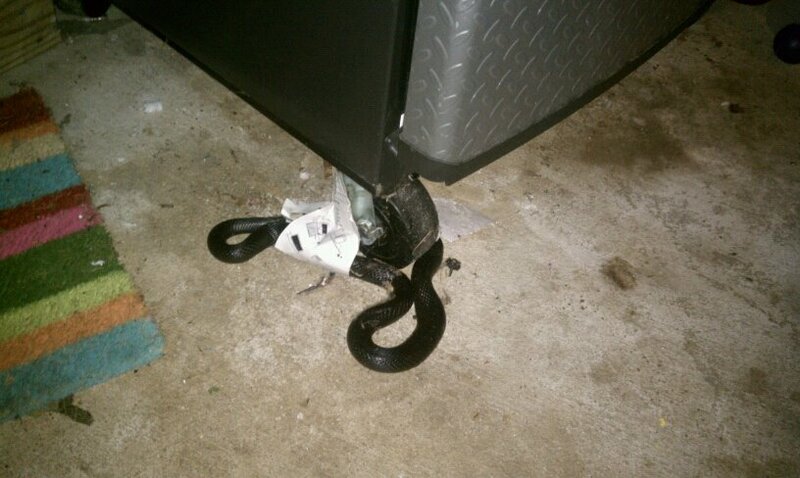 I could have just left him there, because I'm not particularly afraid of snakes, and he was guarding the beer fridge, not the wine fridge, so this was really my husband's problem to deal with. Buuuuut, I could hear in the pitch of hubby's voice as he asked, "What are we going to do?" that this was either going to be my problem or we were going to have to hire someone. Money aside, while we were waiting for someone to show up, I would have had to get my husband his beers, and that is so not me. I’m not that girl. I’m the girl who puts on some gloves and tries to shake off the heebie-jeebies so I can deal with the snake. Unfortunately, some zip-ties had fallen into my gloves, and the feeling of something mysterious and unexpected inside the fingers made me squeal like a… well, like a man. But I got the zip ties out, took a deep breath and went back out to the garage. Of course, we photographed the snake first. (Because if it's not on facebook, it didn't happen.) But there was this annoying paper in the way, making it look like I have a messy garage. So I went to try to take off the paper, and the snake jumped at me. That's when I realized that the paper was a glue trap that our extermination company uses to track what bugs are getting into the garage. Poor snakey. I pulled at the sticky trap some more, but that thing was not coming off. At this point, the snake took off into the... well... into the pile of boxes and general crap that lives in our garage. My husband was yelling, "Get it. Get it. Don't let it get away!" Um, I'm not grabbing an injured snake by the tail, you nut job. You don’t like how I’m doing this job, you can get the snake out of the garage next time. So the snake is getting away. But then his glue trap got stuck on a box. So he's stuck. And bumming. At this point, I started talking really nicely to the snake, hoping we could get a thorn-in-the-lion's-paw thing going between us. It didn’t sound like Harry Potter. I just spoke English. The hubs suggested putting it in a box, which seemed a more reasonable suggestion than me dragging it outside by the tail. So I grabbed a box, spoke soothingly to the snake some more, and then gently unstuck the sticky trap from the cardboard where it was stuck and put the snake in the box. Snakey was with me, the most cooperative snake I have ever had the pleasure of putting into a box. [Yes, yes, please feel free to make pleasure of putting a snake in a box jokes here. I’ll wait.] He thought about jumping out of the box, but I think he knew I had his best interests at heart. Here are two things you should know if you’re ever going to try this at home. One, snakes are stronger than you think. It’s not like a cat or whatever. They are made of solid muscle. Two, snakes are heavier than you think. All of that “muscle weighs more than fat” malarkey must be true, because snakes are heavy! Oh and three, don’t try this at home. Snakes will bite, even the non-venomous ones. Don’t mess with snakes. OK, back to the story. So while I was taking him out, I had my husband grab me some safety scissors. I used the scissors to cut off as much of the sticky trap as I could, so at least the snake wouldn't get stuck on anything else. And I swear, I swear, that snake held completely still for the operation. Good snake. We understood each other. It was kind of nice in a weird way. Except that while this was happening, my husband yells, "There's another one!" Yes, slithering maybe ten inches away from my bare foot on the driveway is a baby snake. With stripes. It was dark out, and I don't know much about snakes, but I don’t mess with any stinkin' striped snakes, because I think we have at least one venomous striped snake in this area. So I hurried to finish up with my massive, but ultimately safe, black snake so that I could get the hell away from the teeny tiny cute 7-inch mystery snake. I looked up that mini-snake on the web later and I’m pretty sure it was a newborn copperhead. Yikes. FYI for anyone reading this because they want to know how to get a snake off of a sticky trap, our pest control company has since told me that the correct way to get sticky traps off of snakes is to use cooking oil, like vegetable or olive oil.